I am pretty sure most of us experienced falling in line to avail a certain product or service; from riding a public transpo, paying bills, buying groceries, eating in fast food chains, or even securing a government issued ID. Most of this takes a little bit of our time so we extend our patience as long as we can. But have you ever experienced falling in line and waiting in vain for the whole day just to secure a certain ID or certificate that you need for work or school? That was back in the days when you need to physically be in government offices, fill out a form, pay in the cashier, secure a cue number and wait, wait, and wait a little longer that you didn’t notice you’ve been stuck there for the whole day or worse, you were caught in the office’s cut off so you have to return the following day and do the same steps all over again. Yup, been there, done that! But thanks to the improvement of technology, everything is just one click away on the internet! We are now privileged enough because the Philippine Statistics Authority (PSA) formerly National Statistics Office (NSO) recently launched their website where you can apply and secure your certificates online. 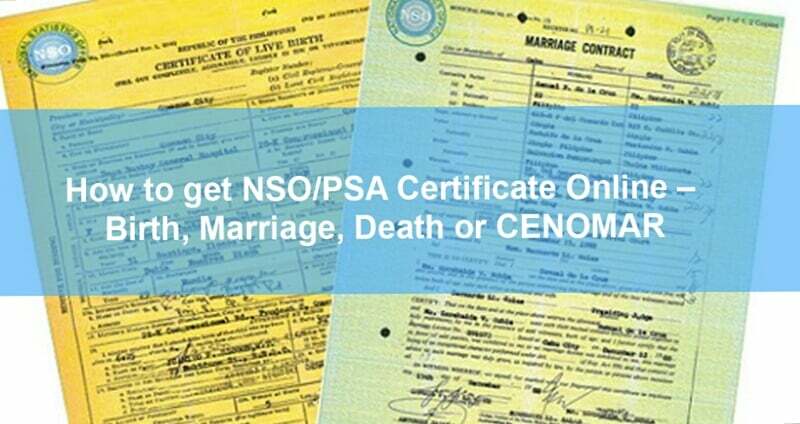 This option is available for all kinds of certificate that the NSO/PSA is issuing like birth certificate, marriage certificate, death certificate, and cenomar or certificate of no marriage. Maybe the next question you have in mind right now is how are you going to secure your certificates through this websites? Worry no more as we here at The News Journal Ph gives you a step-by-step guide to make your application easy breezy! 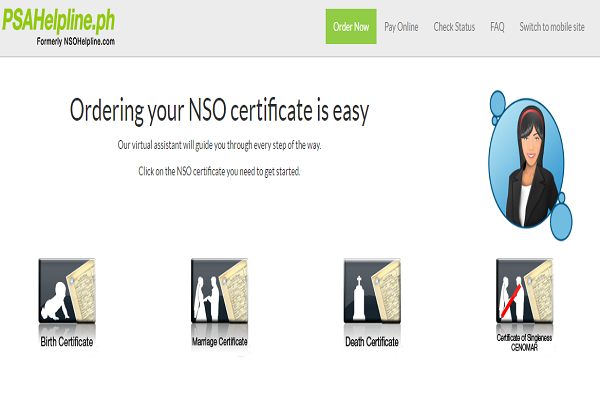 STEP 1: Go to www.nsohelpline.com and click ORDER NOW option. STEP 2: Choose the certificate that you need to request. 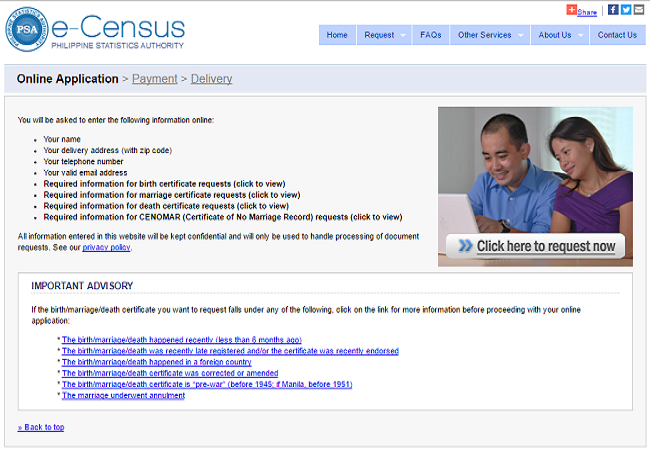 STEP 3: Select the purpose of your certificate. STEP 6: If you’ve experience any legal proceedings (like legitimation, adoption, court hearings, etc.) in securing such certificate choose the option most relevant to your request. STEP 7: Key in the name of the recipient of the certificate. STEP 8: Double and triple check all the details you put on the order summary on the left side of the screen. Then enter your contact information and delivery address on the form on the right side. 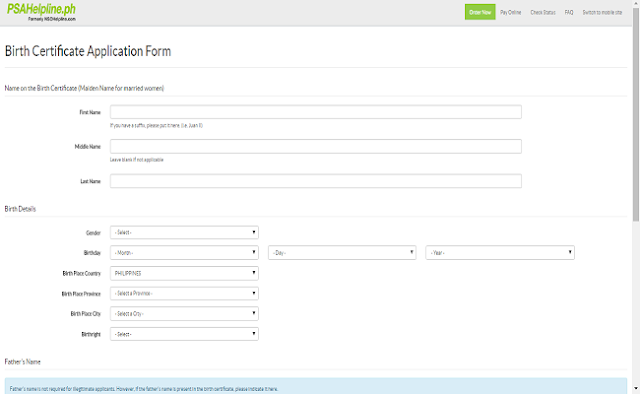 Certify all your entries by ticking the checkbox then click continue. STEP 9: (Almost there, yey!) Pay to confirm your request. You have an option to pay over-the-counter thru Bayad Center and Metrobank Online Payment. VISA or Mastercard credit or debit card are also accepted, same as BancNet ATM and Globe Gcash mobile payment. STEP 10: Once you’ve confirmed your request, you can now check the status of your order in the Check Status page. Just enter the Reference number and click submit. As per the website, you can expect your requested certificate within 2-3 days. Remember, you can leave an authorization letter in case you will not be around during the delivery your certificate. You may actually use the Letter of Authorization provided on the website, just enter the name of the representative that will receive the certificate on your behalf and sign it, make sure your representative have at least one valid ID. And that’s it! Easy as 1-2-3! No need t fall in line and wait for forever! Share this article to your friends to spread awareness and maximize this timesaving option. DISCLAIMER: Phil News Today is not connected with the National Statistics Office (NSO) or Pilipinas Teleserv, should you encounter any problems or if you have further inquiries you may contact NSO Helpline at Hotline (02) 737-1112 or email at nsohelpline@teleserv.ph.